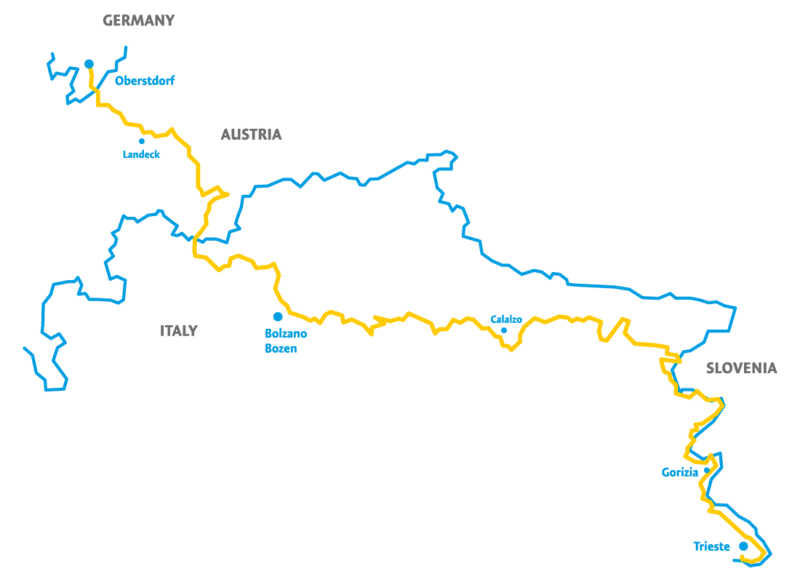 The Via Transalpina long distance trail: Experience the Alps like you have never done before. The Via Transalpina is a long distance trail located in the Alps and is a classic north-south alpine crossing. Starting from Oberstdorf, Germany, leading through Austria and finishing after 750 km in Trieste, Italy, it covers approximately 50.000 meters in altitude in its entirety. It allows you to experience a journey full of contrasts and encompasses a multitude of the most impressive mountain massifs of Europe: the Allgäu Alps, the Lechtal Alps, the Ötztal Alps, the Dolomites, the Carnic Alps and the Eastern Julian Alps. Because of its segmentation into 5 main sections, which are furthermore divided into 103 freely combinable stages, the Via Transalpina is accessible to everyone who wants to experience a unique journey crossing the heart of the Alps. Being a new trail which was developed from the Via Alpina Yellow TrailTM, the Via Transalpina has been modified in order to accommodate every typology of hiker. You can find the information about its different stages within the map section, by downloading the GPS Coordinates and by downloading the Via Transalpina App. We advise you to access this information before your trip, as the Via Transalpina has not yet been equipped with the physical signage along the way.